SecureTeam10 is not alone with their claims. Several UFO/conspiracy websites have posted articles with similar claims despite the fact that they have been debunked many times. Debunk example: Google Earth Blog. The following debunk is silly, but I will provide facts that show this was indeed a joke and not a real base on Mars. Why: because there are still some people who believe in this conspiracy theory. They did: on April 1st 2017. Google posted the joke on April 1st, it was noticed by the world during the same day so the claims that they didn’t tell anybody, nobody noticed, or that it was revealed months later are complete nonsense. I will just show how the joke was made. 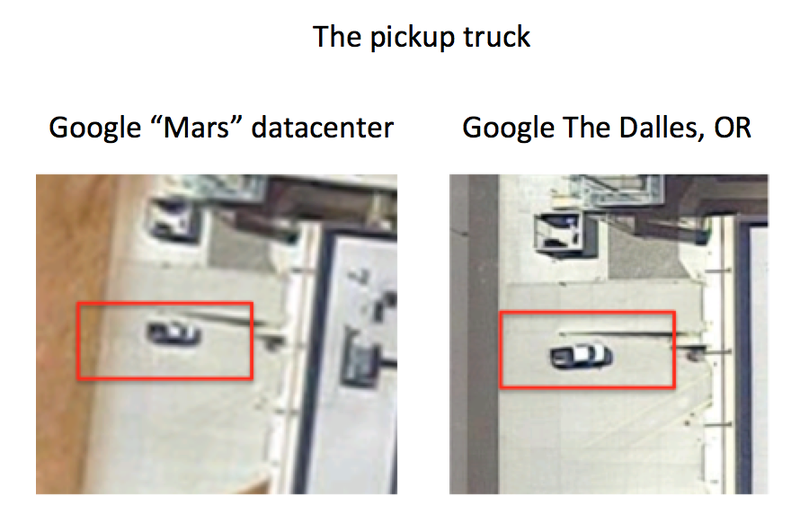 The first picture pair shows that Google simply copied buildings from their own data center images and pasted them on Mars. I have highlighted some obvious details, but there are many similarities. In fact, the buildings are exactly the same. The “Mars buildings” have been re-arranged. Second picture pair: with this building, Google didn’t even re-arrange much. The image has been rotated a bit. 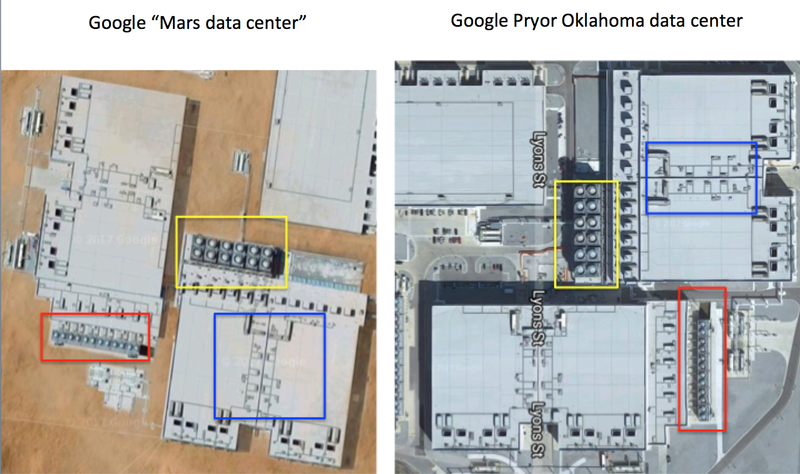 Images of Google’s Pryor, Oklahoma data center were also used. Buildings have been re-arranged. Again, notice that these buildings are exactly the same. And then there’s the pickup truck. Perhaps Google forgot to remove it or perhaps it’s part of the joke. A normal pickup truck on Mars? No skid marks? It could be a hover car or… just a joke. First fact: the door. 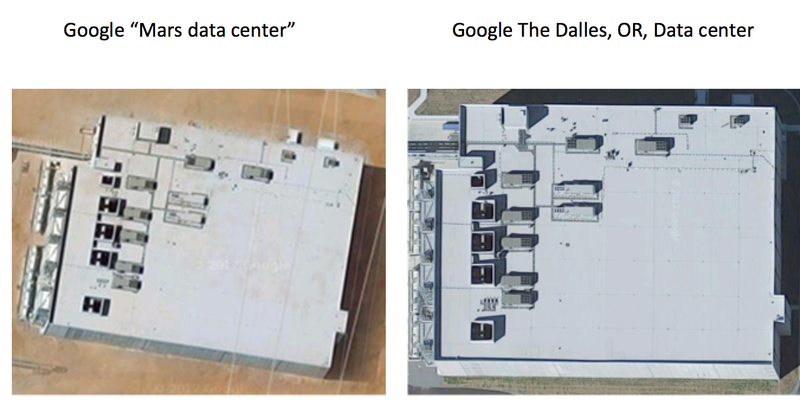 You can walk inside the “data center” Street View-style. The entrance is the door shown below. 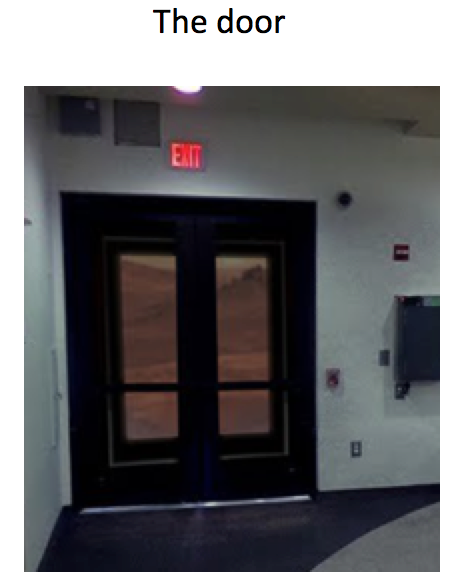 That is a normal door. That is not a “space station door”. It is a joke. About the size of things: these buildings are large. One building is about 190m long (623ft), 50m wide (164ft) and several stories high. There are many buildings. How many rockets or other (non-existing) spacecraft NASA would have needed to transport all the material from Earth to Mars? Probably thousands if not more. Where are all the people who went to Mars to build that base and maintain it – there must have been hundreds. This kind of operation would have been not only impossible but massive. It would have been noticed. Finally, the base is naturally not present in the real photos of Mars. Further reading: UFO Tube – a review of SecureTeam10 YouTube channel. 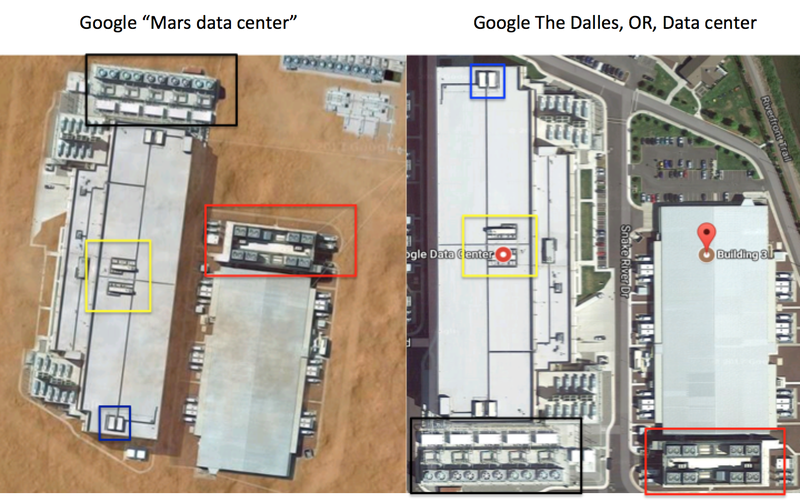 Hoaxeye has done some real work and in the case of the Mars Data Center hoax has shown solidly that Google created the prank with parts of the rooftops of their own data center buildings.